Entry-level portable sawmill with push feed, 10HP gas engine, 24" log diameter, 11' log length and production up to 160 bf/hr. Economical sawmill with push feed, 14HP gas engine, 28" log diameter, 11' log length and production up to 240 bf/hr. Compact, versatile sawmill with crank feed, gas/diesel/electric power, 28” log diameter, 17’ 8” log length and production up to 320 bf/hr. Ready to GO portable sawmill with crank feed, gas/diesel power, 28" log diameter, 17' 8" log length and production up to 320 bf/hr. Wide capacity sawmill with crank feed, gas/diesel/electric power, 36" log diameter, 17' 8" log length and production up to 375 bf/hr. Robust twin rail sawmill with powered saw head controls, gas/diesel power, 36" log diameter, 35-1/2" width of cut, 18' 5" log length, and optional SimpleSet Setworks & Debarker. Extra-wide twin rail sawmill with 55" log diameter, 54-1/2" max width of cut, powered saw head controls, 38HP gas power, and SimpleSet Setworks. Road-ready portable sawmill with manual log handling, crank feed, gas/diesel power, 32” log diameter, 21’ log length and production up to 350 bf/hr. 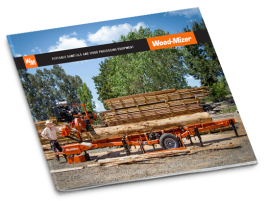 High-production manual portable sawmill with manual log handling, powered head controls, SimpleSet setworks, gas/diesel power, 32” log diameter, 21’ log length and production up to 375 bf/hr. 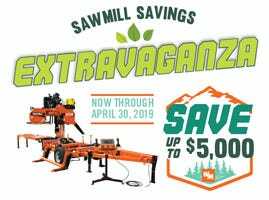 Entry-level hydraulic portable sawmill with complete hydraulic log handling, powered head controls, SimpleSet setworks, gas/diesel power, 32” log diameter, 21’ log length, and production up to 500 bf/hr. Professional hydraulic portable sawmill with complete hydraulic log handling, powered head controls, SimpleSet setworks, auto clutch, gas/diesel power, 36” log diameter, 21’ log length, and production up to 550 bf/hr. 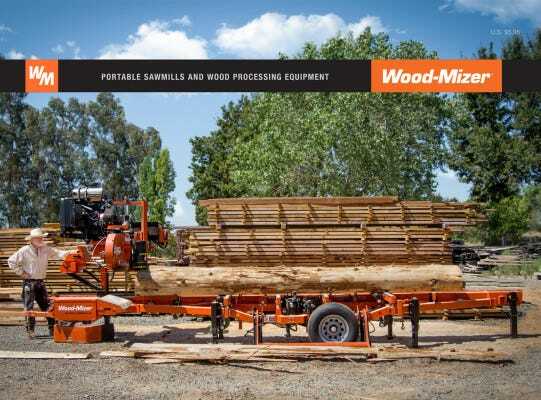 High-performance hydraulic portable sawmill with advanced hydraulic log handling, fast powered head controls, board return, Accuset® 2 setworks, gas/diesel/electric power, 36” log diameter, 21’ log length, and production up to 675 bf/hr. High-production twin-rail hydraulic portable sawmill with advanced hydraulic log handling, powered head controls, board dragback, Accuset® 2 setworks, chain log turner, vertical side supports, fine adjust outriggers, gas/diesel power, 36” log diameter, 34" width of cut, 21’ log length, and production up to 700 bf/hr. High-production hydraulic portable sawmill with advanced hydraulic log handling, fast powered head controls, board return, Accuset® 2 setworks, chain log turner, vertical side supports, fine adjust outriggers, gas/diesel/electric power, 36” log diameter, 21’ log length, and production up to 700 bf/hr. Fast and fully-loaded hydraulic portable sawmill with deluxe engine-powered hydraulic log handling and head controls, pedestal control station, board dragback, chain log turner, vertical side supports, fine adjust outriggers, debarker, LubeMizer lubrication, diesel power, 36” log diameter, 20’2” log length, and production up to 1050 bf/hr.